Long a classic text for the teaching of principles of economics, the current economic crisis makes this book an even more essential resource for faculty who want a solid introduction that calls on policy based information for examples and applications. The authors have been on the forefront of advising policy makers and informing the public for years and Alan Blinder, in particular, has been highly visible through the discussions of the current economic situation. The update ensures that faculty who want to teach using the latest policy issues and data are able to do just that. Not only will MICROECONOMICS: PRINCIPLES AND POLICY, UPDATE 2010 EDITION,11e have the absolute latest data through spring 2010, but will also include a new chapter focuses on the financial It achieves the right level of rigor and detail, presenting complicated concepts in a relatively straightforward manner and using timely economic data. Using puzzles, issues, and well-developed examples, the authors provide a good balance of theory to application, allowing students to relate the materials to their everyday life. 1. 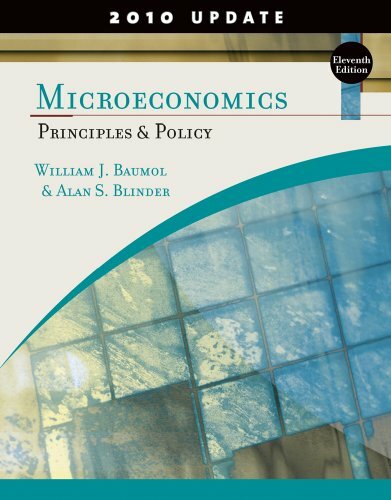 Microeconomics: Principles and Policy, Update 2010 Edition (Available Titles CourseMate) Baumol, William J. and Blinder, Alan S.
Baumol, William J.; Blinder, Alan S.